About: Popular with the media crowd, The Dog & Duck serve a variety of beers, wines and spirits and can cater for private parties of up to 35 guests upon request. Seating on the pavement area is provided, weather permitting. Cramped on the ground floor, spacious above, The Dog and Duck regularly forces people out onto the pavement outside. But catch it at the right time and you will be treated to a fine example of a traditional pub. Take the ceiling’s resemblance to a stamped waxed seal, the tiled floor or the big gold chandeliers as proof that you are in a classic pub of true greatness. Soho’s Dog and Duck has had an array of famous visitors over the years. Madonna was known to pop in when she was in town and going further back, it was also a favourite of John Constable and George Orwell. "Awesome traditional interior and a favourite of George of Orwell's"
Most of the traditional pubs in Soho lay claim to their own historical facts and fantasies but The Dog and Duck has more to it than most. A famous literary pub, this was where Orwell used to drink. Despite a undergoing refurbishment not so long ago it wouldn’t be hard to imagine that there isn’t a great deal to have changed since the times when the author of Down and Out in Paris and London would have stopped here. Far from the rotten jobs and unemployment he experienced in that book, Orwell would have appreciated the decorative tiling, carved wooden bar and ornamental additions, which remain today. 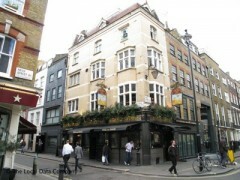 Located on the corner of Bateman Street, The Dog and Duck is a compact little boozer. The diminutive size of the ground floor means that the street outside is prone to picking up the overflow during summer months. But then this is Soho and when it’s warm that’s where everyone really wants for those long lazy evenings. Beyond the traditional attraction – which is worth a visit alone – there is an upstairs dining room that offers extra seating. This, the George Orwell Room, offers a classic Nicholson’s pub grub menu with the likes of fish and chips and sausage and mash. Nothing special, nothing spectacular; in a way just a menu that pays homage to the past. Visit The Dog and Duck for the history and be charmed by the interior of this handsome pub, just don’t expect to find a quiet reading spot in amongst the Soho media crowds. This has been a great pub over the years up until recently. Since the new year there has been some sort of management and staff change and my last experience was on that has been substandard to those of only a few months ago. The staff were rude and the new manager uninterested in providing any service. Shame the old staff and manager are no longer there!